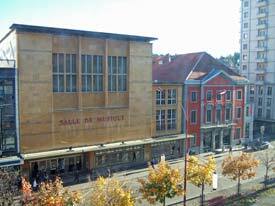 ABOVE: The Salle de Musique and the Théâtre L'heure Bleu (red building) share a lobby and box office. INSET BELOW: The restored theatre auditorium, the stage of the Salle de Musique, and flip-down seats along the aisles. "Classified as a historical monument of national importance, the theatre was built in 1836-1837 (meaning a dozen years before the first hospital!) and entirely restored in 2003. The music hall and its décors in Louis XV style, notably the symbolic 'Comédie' masks, make it a rare gem. With that of Bellinzona, it is the only 'Italian-style' theatre in Switzerland." Next door, the Salle de Musique is an attractive wood-paneled symphony hall from the 1950s with an impressive organ behind the stage. The acoustics are said to be excellent, and I was able to hear a tour guide speaking near the front of the hall while I took photos from the back. The local tourist office will arrange guided visits for groups, who can choose between a 60-minute visit and a 2½-hour city tour that includes the theatre and music hall. To inquire about individual visits, e-mail [email protected]. And if worse comes to worse, you can always stop by the box office and beg to peek into the auditorium.